"Nothing beats a good old Nokia alpha-numeric phone that doesn't break." That's what my mom would always tell me whenever I'd tell her to swap her old (but still A-OK) Nokia candybar cellphone for any of the phablets that I have in my collection. If you're like her (in that sense) or if you're simply looking for an affordable yet reliable and durable feature phone to be your primary or secondary handset, I'm sure the sight of the freshly announced Nokia 215 and 215 Dual SIM will put a smile on your face. Microsoft Corporation may have already purchased Nokia's handset business to further the growth of its Windows Phone operating system and its slew of mobile services for work and productivity but apparently, the Redmond Giant hasn't altogether laid the Finnish company's legendary basic candybar line to rest. According to Microsoft, "In 2014, 60% of the World’s population still didn’t have access to Internet. 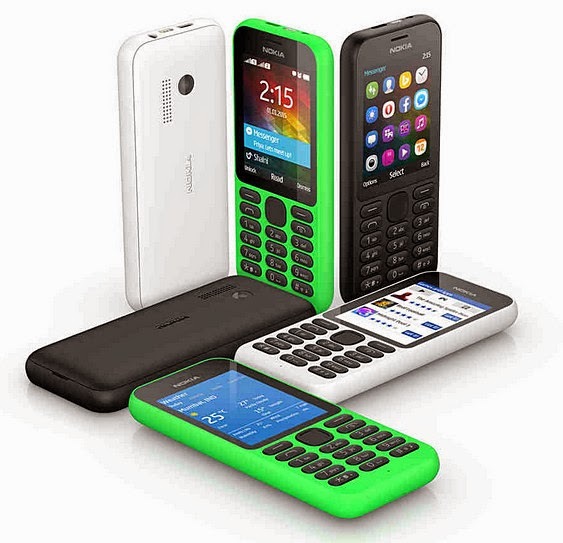 Our entry-level mobile phones like the new Nokia 215 and Nokia 215 Dual SIM pack mobile life and everyday essentials in an affordable package to connect people in new ways. Whether you are a first-time mobile phone user looking to enter the mobile-first world in style or a smartphone user looking for a perfect companion device, Nokia 215 offers you great features and all the essentials. 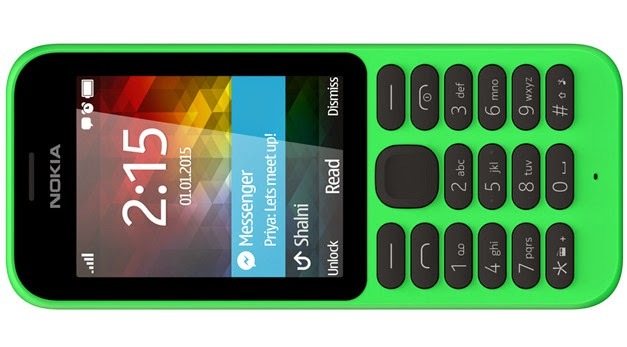 All the goodness of the Nokia 215 comes in your choice of stylish Bright Green, Black or White. The Nokia 215 is packed with so much features, all for only $29. See it for yourself in this infographic." I'm in my early 30's and I've been very fortunate to have owned some of Nokia's legendary candybar phones with alphanumeric keypad in the past -- from Nokia 5110 and 3210 all the way to Nokia 101 and X1-01. And if there's anything I can tell you about these handsets, it's that they're really built like a tank and are crafted to last for many years. 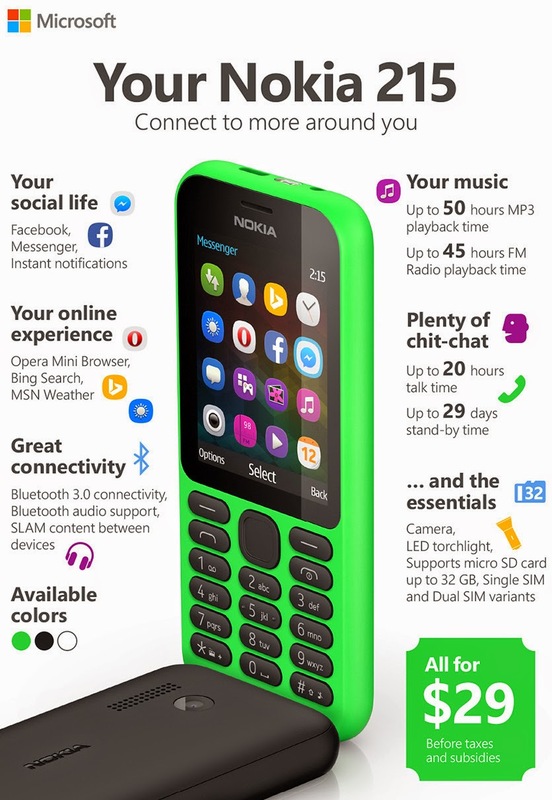 Nokia 215 bears the mythical genes of its predecessors and incorporates all the wonders of current-day mobile internet, wireless sharing, and social networking to deliver an enjoyable user experience. To quote Microsoft, "Nokia 215 has pre-installed Facebook and Messenger with instant notifications, so you’ll never miss out on the latest from your friends. Check your friends’ news feeds, update your status, and keep in touch with those long-distance relatives. Prefer your social updates in bite-sized chunks? Tune into Twitter, also easily accessible on this entry-level phone. Browsing the web is super-easy, thanks to Opera Mini Browser and Bing Search. And don’t take a chance on the weather. Get the latest weather conditions using MSN Weather and see accurate hourly or 5 day weather forecasts, wherever you are. With Nokia 215, you can also now connect in new ways by pairing your device with a Bluetooth headset or speaker. Sharing content is simple with SLAM technology. Simply bring two SLAM-enabled devices together to send or receive files." On top of all that, Nokia 215 has two features that will definitely delight consumers. First, it has a built-in torchlight which should come in handy when you're looking for something inside your bag or during sudden brownouts. And second, the phone has a large 1,100 mAh battery pack for an extended uptime; Nokia 215 Single SIM - Microsoft says - has a stand-by time of up to a whopping 29 days while Nokia 215 Dual SIM offers up to 21 days. For those who like to talk, Nokia 215 provides up to 20 hours of talk time. With a built-in MP3 player and FM radio, Nokia 215 keeps you entertained for up to 50 or 45 hours playback respectively. So when is it arriving here? The Philippines has always been a major market for feature phones like this so I'm expecting Nokia 215 to be released here - along with Africa and India - sometime within Q1 2015. As for the local SRP, I'm guessing the two versions should come in at around Php 1,300 to Php 1,600.